Rain, Rain – Where are you? 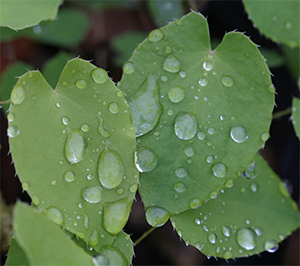 Dainty Epimedium leaves collect raindrops after a spring rain. Last year at this time, we were singing, “Rain, rain, go away!” and many of the tips in my newsletters were addressing disease and pest problems associated with excessive rainfall. This year has been as dry as last year was wet. We need rain – BAD! Yesterday we got a little bit of rain and it was the good kind, too; slow, gentle, and soaking – but not enough. I was listening to Andre on the radio yesterday (his local Tuesday morning show) talking about how dry the ground is. He and the guys have been in the field digging daylilies and he was commenting that the soil was dry as far down as they were digging – a good 10 inches. That is very unusual for this time of the year and is bad news for the farmers who rely on the spring soil moisture for the germination of their corn and other crops. Normally in May, there is good residual moisture in the soil from winter and early spring precipitation. What about all that snow! I’m sure everyone in this area remembers our record snowfall of this winter and I remember that one day in February the local schools were closed due to flooding! Where did all the water go? We started the year in great shape, a surplus even, but we haven’t had a good soaking rain for a very long time. Lack of rainfall, combined with low humidity and many days with strong winds have sucked the moisture right out of the ground. Now it’s time to get out the sprinklers and start watering; but when you do, be sure to water correctly so you do not waste this precious resource. A good sprinkler that delivers water slowly and gently will go a long way to prevent excess runoff and water wastage. The sprinklers we use here at the nursery have been specially designed by Andre with a small nozzle that puts down less water per hour than most sprinklers. When you water, try to water slowly and deeply over an 8-12 hour period. This will encourage the growth of deep root systems which will make your plants more drought resistant. Generally, if you water deeply (putting down about 1½” each time you water), you should not have to water your garden beds any more often than once every 10 days or so. 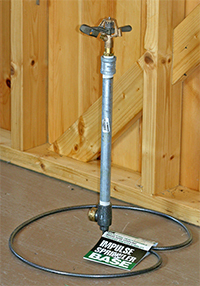 Click for more information on proper watering techniques. Until next time – Happy Gardening and hope for rain!